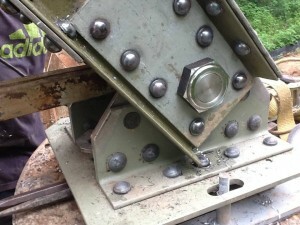 If you are looking to restore a historic metal truss bridge, or other historic metal structure with rivets, and you want to stay in keeping with the original design and appearance of the structure, then any rivets that are replaced should be replaced with rivets. 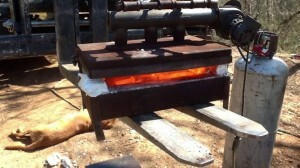 Unlike BACH Steel, most fabricators do not do riveting, and will advocate making repairs using modern bolts. 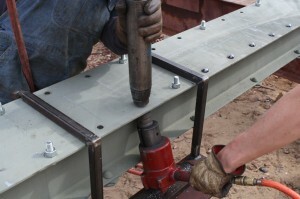 Bolts don’t look as nice, and they differ from the original design of a riveted structure. Rivets are historically correct, have a nice clean appearance with their round heads on each end, and their durability and reliability is evidenced in the many extant bridges and structures over 100 years old that are held together with rivets. Rivets driven by BACH Steel craftsmen are of quality construction, ready for a century of service, just like the rivets driven in the 1800s that have lasted to this day. 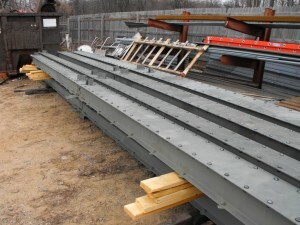 BACH Steel can drive quality rivets efficiently and at a cost that is competitive with the cost of using bolts. Given the choice, we always prefer to replace rivets with rivets!